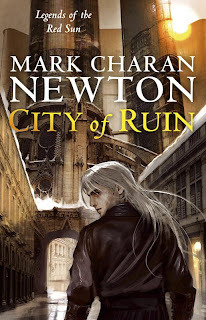 Our favorite author Mark Newton (FBC Interview) author of the much talked about "Nights of Villjamur" (FBC Review) has just revealed the title and tentative cover of the second Legends of the Red Sun novel, "City of Ruin" which moves the action from Villjamur to Viliren. Viliren: a city of sin that is being torn apart from the inside. Its underworld is violent and surreal. Hybrid creatures shamble through shadows and there is a trade in bizarre goods. The city’s inquisition is rife with corruption. Barely human gangs fight turf wars and interfere in political upheavals. The most influential of the gang leaders, Malum, has nefarious networks spreading to the city’s rulers, and as his personal life falls down around him, he begins to embrace the darkness within. Amidst all this, Commander Brynd Adaol, commander of the Night Guard, must plan the defence of Viliren. A race that has broken through from some other realm and already slaughtered hundreds of thousands of the Empire’s people. As the enemy gather on the next island, Brynd must muster the populace – including the gangs. Importing soldiers and displacing civilians, this is a colossal military operation, and the stress begins to take its toll. After a Night Guard soldier is reported missing, it is discovered that many citizens have also been vanishing from the streets of Viliren. They’re not fleeing the city, they’re not hiding from the terrors in the north – they’re being murdered. A serial killer of the most horrific kind is on the loose, taking hundreds of people from their own homes. A killer that cannot possibly be human. It is whispered that the city of Viliren is about to fall – but how can anyone save a city that is already a ruin?